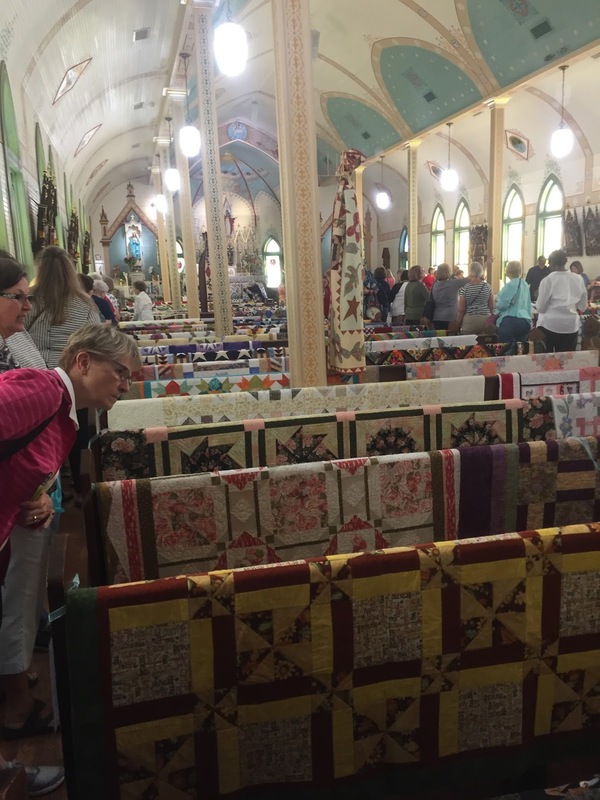 You have one day left to make it to the St. Mary's Quilt Show this year...Tomorrow...and it's done. Do you really want to wait a whole year to see it? The answer should be NO! I went yesterday, after getting a surprise babysitter for Bailey...I had pre-ordered a Quick Pass. And I highly recommend you do this next year! I requested the time of 11:45 AM for Thursday. My thoughts were that I would beat the rush of all the amazing quilters in our state. Well, I arrived at the Welcome Desk at 11:41 AM to get my ticket. The people who were in line without a quick pass - those who wanted free admission (donations were accepted), were already getting tickets for 2 PM! WHOA! It was totally worth $15! The parking attendants were wonderful and very polite. No one yelled at you and you were greeted with a loving smile and a friendly greeting. 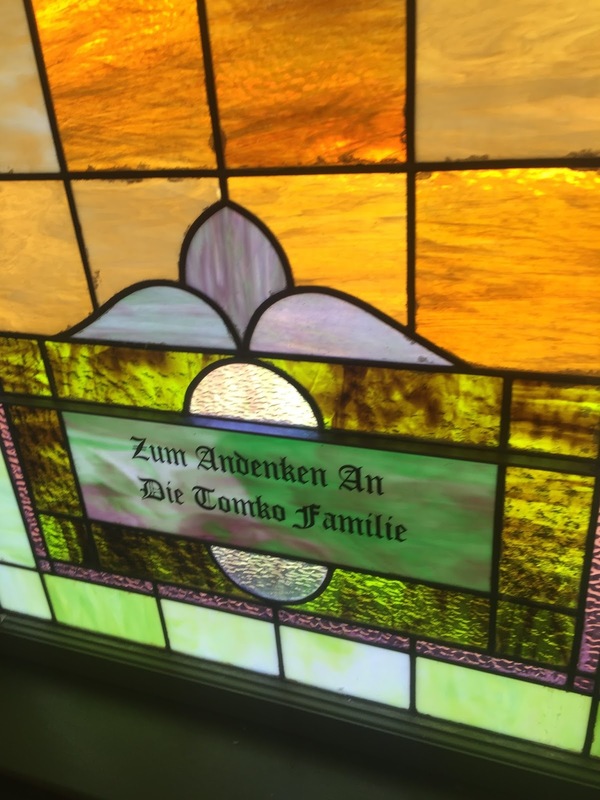 It's a church afterall...what did you expect? I expected different...I've directed traffic before and sometimes it can be just nuts and sometimes people lose their tempers. I'm no saint. There was one guy who had Mickey Mouse gloves on while he directed traffic. It was a great idea! It was large and bright enough to see. WONDERFUL! I walked onto the gorgeous grounds and immediately you see quilts and quilt squares everywhere. It was so delightful to see. I followed the signs to the Welcome Desk and got my ticket from a volunteer who advised me to go immediately to the church for entry. I'm so glad she told me! I made it to the church doors where a line of other 11:45 AMers were waiting. It appeared to be a group and they were casually talking to each other. Just casual conversation...and then...we were allowed to enter the beautiful historic white church. 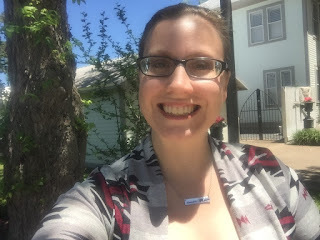 Now I don't want to overwhelm you...but I did take nearly 350 pictures in just a few short hours of being at the quilt show. I won't show all of the pictures I took, but I will share with you my favorites! So you walk into the door on the far left, where you see people standing around in the above picture. That's where your ticket was checked. When you walk in, you hand in your ticket for a blue little ticket. 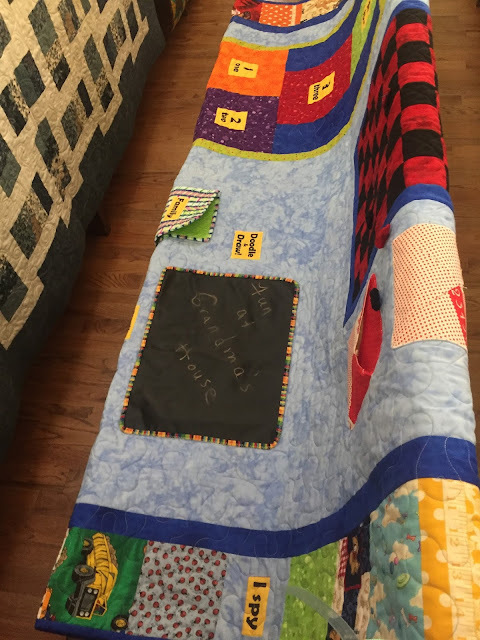 After viewing all of the quilts, you can select your favorite one and vote for it. I'm not sure what prize they get for winning, maybe some bragging rights? 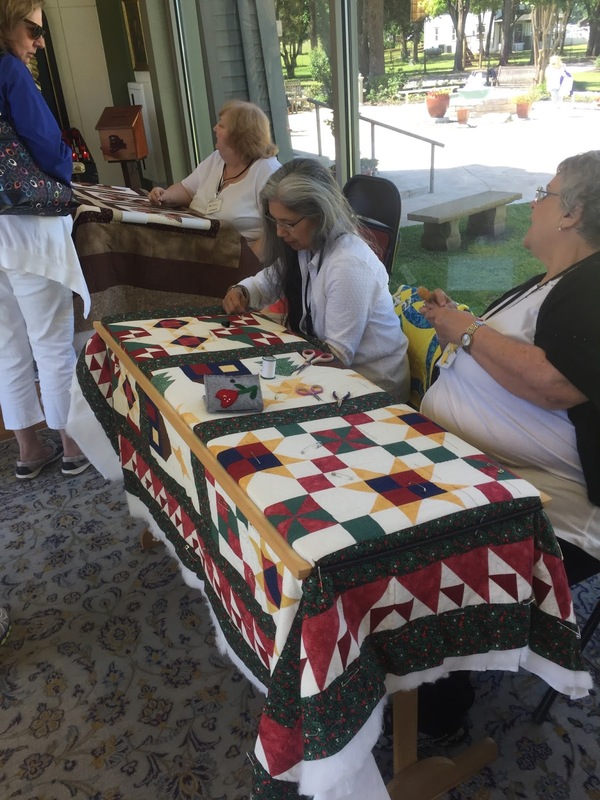 Once you trade in your ticket, you will see a few people demonstrating hand quilting. MY FAVE! I heard several people make comments about how tedious it was or how hard it looked to them. 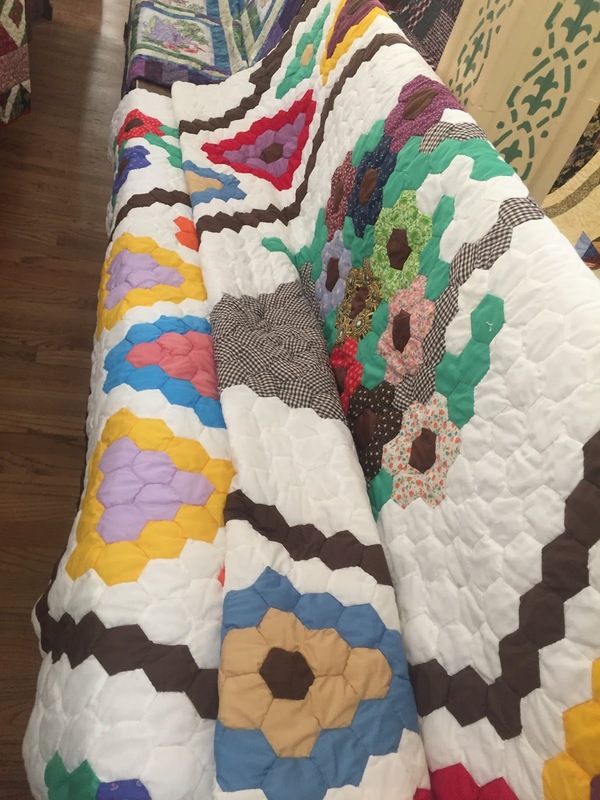 You should have seen their faces when I said that hand quilting was my favorite. PRICELESS! 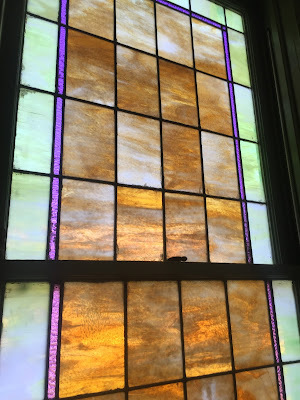 I have a friend who does historic preservation...and it was everything I could do to not stop and call her. I'll have to send her a link so she can see the beauty and appreciate this church as much as I do. The ceiling was so beautiful it made my neck hurt! I just wanted to soak it in and stare at it. Whoever painted this...did an amazing job! Oh! It's a sight to see...let me tell ya! 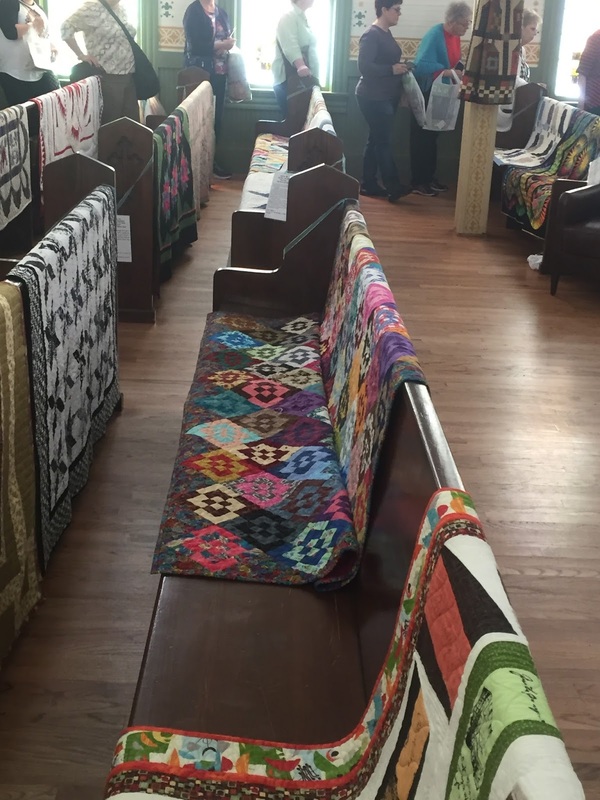 The quilts were everywhere and simply drapped across the pews. If you wanted to see one for closer inspection, you were asked to get a volunteer who had gloves on to handle it for you. (I really like this idea!) The volunteers were so nice and spoke to everyone and answered all of their questions about the quilts and the church. Now for some of the quilt pictures...Better sit down...There's a lot. This was the only hexi quilt I saw at the entire quilt show. 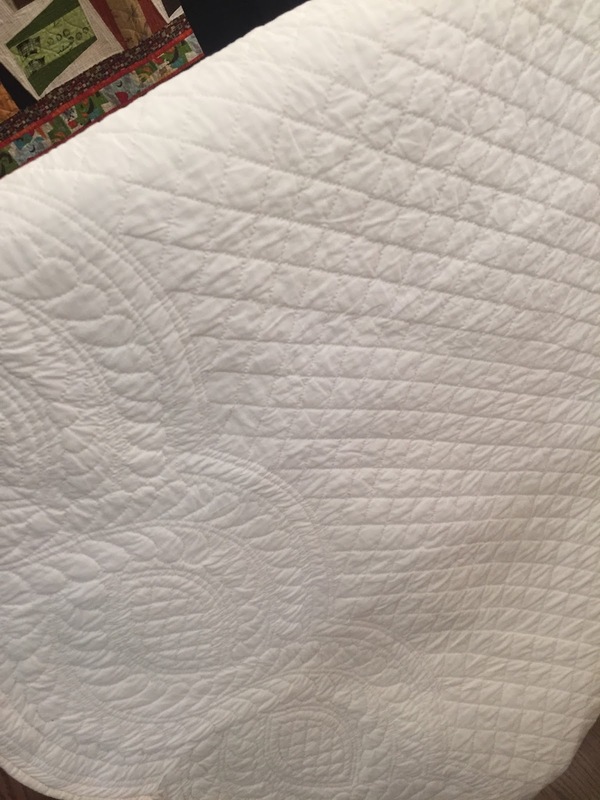 Hand quilted...over 1900 yards of thread. Each quilt had a story tag that the quilter had the option of telling. Some were very detailed and some were not. Each one had a number and that was the number you used to vote on your favorite. There were so many quilts...so many different patterns, styles, fabrics...you could really sense the creativity that was used in the making of all of these quilts. You could even feel the LOVE that was put into these quilts. The quilts also had different skill sets. You could tell some were very detailed and they took years to create. 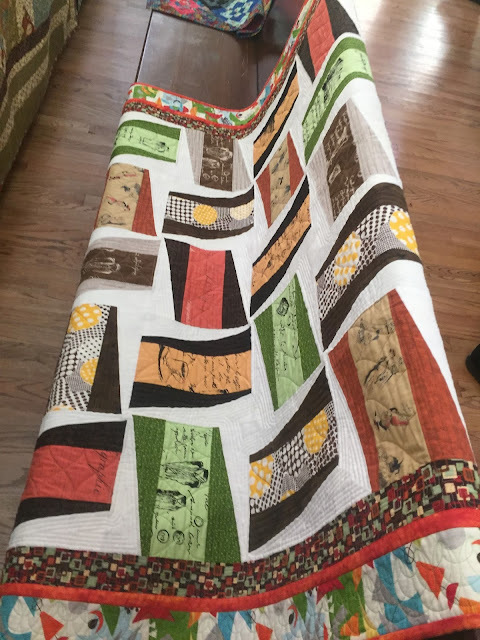 There were layer cake quilts, jelly roll quilts, embroidery, applique, scrap quilts...the list goes on and on. Children's I spy quilts, quilts made with old scarfs and some made with baby clothes, some that were handed down several generations before being completed, and some quilts that honored different professions: nurses, law enforcement, EMS, and the fire department. Check out my Instagram page for the answer! LOL. Under the covered pavillon, were tables and chairs (and more quilts) for everyone to gather and eat. There was food available for purchase and live entertainment! During my visit, I enjoyed the acapella group - The Chord Blasters. An all woman's group of acapella...who sang hymns/spirituals while we eat or sat with a free bottle of water. They actually did a great job and encouraged the audience to sing along with them. Now, with all the beauty of the gardens...the photo opps, the love of the quilts screaming into your soul...I do have one complaint. Of course, right? Nothing is perfect. When I went into the area where the vendors were...they would look at me...and would not talk to me. Not one vendor approached me and asked if I needed help. Not one vendor greeted me. Not one. I couldn't figure out why...I walked into several booths and looked at items and never did anyone acknowledge my existence. I did finally feel that maybe I should approach them...So I did...and after I asked a vendor where they were located (while pointing to the sign that had their business name and city/state)...I was immediately answered with "Do you sew?" Not an answer to my question. I knew the town very well and did not know this vendor's location within the town. When I answered her question and said yes I also quilt...she then just gave me the town again as her answer. I told her I see that and pointed to the sign again and said where in the town because I know the town very well. THEN...and only then...did she seemed to enjoy the conversation with me. I have a rule...when I go to quilt shows/shops...I believe in purchasing from local shops and not corporate businesses. If I can, I will. 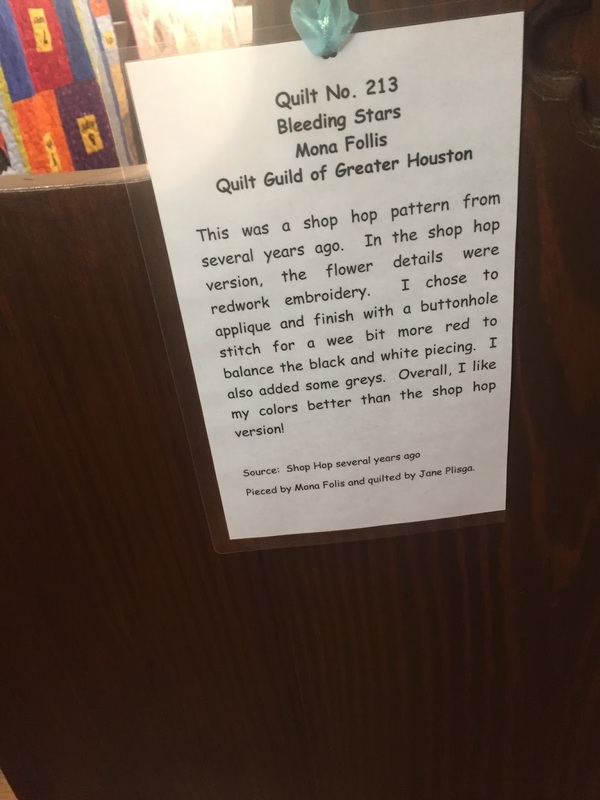 That being said, I love to go to quilt shows and support small business owners. I will NOT, however, make a purchase from any business (local or corporate) if I'm not shown politeness. You don't have to know everything, you just have to be nice. If I say hello, say hello back... (Yes, there was a vendor who did not say hello back.) I don't think that's a very hard requirement, especially in business. I don't care how much I want something...I won't buy it. I will take a picture of it, barcode if possible, and find it elsewhere. Needless to say, no purchases were made. It was a sad day for my sewing room. They were so looking forward to meeting new friends: fabrics, notions, threads, etc. Not one came home. HOWEVER! I'm still elated with joy from seeing all the quilts in the church. It was really an experience. You MUST go. The church staff/volunteers were so wonderful and helpful. Everyone seemed to be enjoying their meals too! I didn't see food getting thrown away, only clean plates. That's a good sign! I'll try out the menu next year. SUPPORT ST. MARY'S CATHOLIC CHURCH QUILT SHOW by going and enjoying yourself. Make a donation...Eat a plate of their delicious meals! The only question left is which quilt show should we go to next? 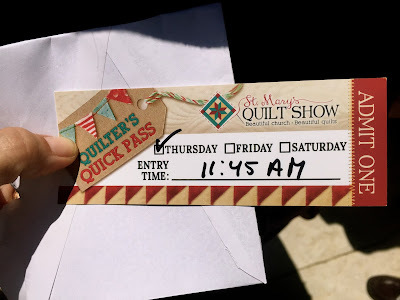 Post in the comments which quilt show you are going to next! Even the Columns of the church looked almost quilted. Awesome pictures. I've never been to a quilt show.